cli.gs Yes Yes Yes Stats are private, real time and very detailed, geotarget URLs based on country of visitor, bookmarklet. I give an honorable mention to Minnesota based culld.us from Garrick Van Buren as well. Culld appears to work well with basic shortening features and is in cahoots with the Cullect feed aggregator. There are others that were suggested like bloat.me and URL.ie but I wanted to keep this review to 11. If you really need a URL shortening, truncating or redirecting service fix, then check out this bigger list at Mashable: 90+ URL Shortening Services. I do have a feature request for these services though. A URL shortening service that also posts to Delicious and/or StumbleUpon would be nice. A URL worth shortening is also often worth bookmarking and it would be a nice time saver to do both. Just a thought. What is your favorite URL shortening service? My vote goes for TinyURL.com. Honestly I dint even know the other guys existed ! lol Courtesy – Twitter. 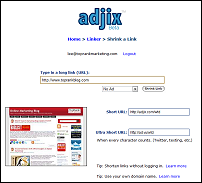 I wonder what people think of adjix – the service that lets you make money from link shortening? I’ve only seen Guy Kawasaki using adjix. Curious myself but no time lately to check out. Others? I’m a cli.gs fan. I like the stats. I must admit that I haven’t really tried the others…when I find something that meets my needs, I tend to stick with it. For me the geotargeting that Cli.gs offers puts it over the top. Zima comes in a close second, IMO. @Mani, once you use a service with real time click stat tracking, you’ll never go back. ReadWriteWeb posted an article yesterday Bit.ly’s Firefox plugin that lets users hover over shortened URLs from some other shorten-url services to see the resulting full URL, click-throughs, etc. The other shorten URL service that provides detailed analytics is TwitClicks.com. Again, have not tried it, but you can watch a movie on their site demonstrating how it tracks Twitter advertising. Although it’s not the shortest link service. I like the words it makes, “Twitter Me” and it allows you to customize the tag. The other thing I like about it, is that it is relatively undiscovered, so it has my two previous links listed as the number one and number two ranked link throughs. Most importantly, I can easily remember the tag that I used for each article rather than something like “xrEI84r”. Thanks for the post. Great idea! and if possible, “API” column. Thanks for putting together this vote. We’re honored to have Adjix in the top 11. I’m looking forward to the final results, but I’d be surprised if they differed much from the post you referenced on the cli.gs blog. The founder of cli.gs, Dr. Pierre Far, Ph.D., did a thorough job analyzing the data that Twitter released to the public. I think that represents a great sampling. The monetization angle of your service is very interesting Joe. Looking forward to seeing how it pans out. A key difference between these services is how they handle shortening to the same destination. Some have a global short URL that everyone gets, some have a user-specific short URL, and some allow an unlimited number of short URLs per destination. Each approach has upsides and downsides and users need to understand this as it affects how the service helps them. The API is also very important. Some have APIs that allow unlimited access and user-specific access, some don’t like heavy volume, etc. The API really affects how users can create and get to their data. A lot of these services are supported by Twitterfeed and/or Tweetdeck (because you mention Twhirl support, Tweetdeck and Twitterfeed should be mentioned too, IMHO). Some have WordPress plugins that can do neat things. Cligs and bit.ly (as far as I know, the only two that do) have Google Gadgets which you can embed in Gmail, iGoogle, or any other page really. Some services are supported by or support various Firefox extensions like UrlbarExt (a whole bunch) and Ubiquity (at least Cligs and zi.ma). Thank you for the analysis on all the services Pierre. This is just a min-review of 11 difference shortening services and I think everyone reading appreciates the insight you bring to the table on how these kinds of tools actually work. Honestly I always just use Tweetdeck or BrightKit to shorten my URLs – never an individual site. I guess I only ever really need to shorten a URL for a Tweet, otherwise I just include a hyperlink in an e-mail. At least with http://www.cli.gs I know I have a genius working full time behind the scenes while offering a full featured URL shortener. I like how the Firefox button makes it really easy to shorten URLs and then cli.gs makes it simple to tweet the renamed and shortened URL. I don’t mean to be negative but isn’t Zima just a custom design on top of this $60 script? I mean, it definitely has it’s functionality but it doesn’t seem to be in the same league as some of these others. Cligs definately my favourite because of the analytics option. Thanks for including BudURL in your survey! One clarification is that we use a 307 redirect instead of a 301 redirect on purpose. Our research shows that this is a more powerful redirect method for tracking purposes and provides even better SEO pass-thru. This is the redirect methodology used by Google, Blogger, and Feedburner. Thanks again for including us and we look forward to the feedback! Thanks Andy, I had noticed the 307 and noted that along with a link to a spec page about it. Am curious what practicing SEOs think about that. Andy, I’d love to see your research on that because Google specifically tells webmasters to use 301 redirects. In fact, 307’s are temporary redirects making them much more like a 302 rather than a 301. As most SEO’s will tell you, temporary is not the way you want to go unless the page will be back to its original location soon. Since the pages will never be on budurl, I would suggest that not only should you not use 307’s but that they could conceivably do harm. And last but not least, is the 307 even valid in the latest version of html? I know it was in 1.1 but I didn’t think it made it much past then (admittedly I don’t know for sure). My personal favorite is definitely Budurl. Zi.ma, comes in 2nd. Thanks Lee, I have been using tinyurl but after reading this post and seeing the results I checked out cli.gs and budurl and both look very promising. TinyURL has always been my choice until BudUrl.com came along. Anyone who wants to see instant information on outgoing email or ongoing results, need look no further. It has all the elements of tinyurl with humongous instant result data at your fingertips. BudURL is the smoothest and most friendly. Definitely aggressive in building out more functionality and listening to users for what is most needed in tracking shared URL’s as well. BudURL is simply the best. TinyURL can go to bloody hell! definitely BudUrl.com. i can track my links, shorten my links…it’s great! You do realize you can track your links with several of the services on this list right? I like to use my own custom forwarding service via a WP plugin, then it’s easy to use any other service mentioned. I’ll try all of it, please give us more list, thank you very much for this information. beginner. I also like http://tw.itter.me as well. I had a link appear on their homepage for about 4 days and it actually brought me a decent amount of traffic to my blog. I made a few links with the tags I wanted before all the good ones were taken! I’m out of touch and behind the times as usual. I have used tinyurl in the past, but will have to check out some of the others. Thanks for the tips! Budurl has some great features, and looks like a great way to get control of my ever-growing bookmark lists. I would really like to see a URL shortening service that shows as a referral in Google Analytics. Then I can evaluate the effectiveness of that link in context of traffic and Goals. Great post – I was excited to see everyone’s responses! My favorite is BudUrl, but now that I am seeing the results, I think I will be checking out Cligs. Sadly, any of the URL shortening services can go bad on you. They could either change their service so that it blocks PR or they might send your traffic somewhere that you don’t want it to go. I guess, if you are serious about link shortening, you should just do it yourself and make your own redirect program. Kevin, you make a very good point. Relying on any third party for something as indefinite as link redirection is a risk. Several of the services listed above include domain name aliasing od subdomains to address this issue. You also missed http://rde.me — Pretty new but has all the features including a firefox add-on and the URL’s are short! @Kevin, yes, definitely agree. That’s why I created low.cc, and for as long as I use it myself, I’ll let anyone use it 🙂 Fair? And I’ll keep tweaking it till I get it “just” right. Next is better referral stats. The only time we do a 302 is if you use a custom URL. I apologize for a mistake in the last comment. I read the table incorrectly and see that you have bit.ly listed as supporting 301. Misread the table–mea culpa! Maybe I’m missing something, but I don’t see my personal favorite ow.ly on the list. That’s my vote for clean and simple. I think is.gd could be the shortest shorten url service. I really like its bookmarklet. I used to use BudURL, until they started charging. I could keep using their free service without a problem; but Cli.gs came along and I started using them instead. Cli.gs is definitely my favorite. I found one called traceurl (http://traceurl.com) that tells you how many clicks your URL received; but an added feature is you can create URLs to files on Box.net. I think your content is very helpful for the guys with one website. I have found many excellent pieces to help me market my ecomm site. There are so many of them. I just use tiny url because its easy to remember. From this day forward…..I’m trying the bud & cligs fellas! Great stuff. I’ve started using idek.net from @covati. His service is continuing to grow. yea tinyurl all the way for me! Because of the advantage of tracking the activity on my cloaked links, I have been using Jonathan Legers’ offto.net for all of my cloaked linking. TinyURL is the only site that I’ve ever used, because frankly until now it was the only site I’ve ever known of. Now that I see the light of my other options I’m glad to know that these other sites offer much more variety and a wider array of tracking options. For everyone with a Clicky Pro account their new Clicky.ME provides Detailed Analytics Tracking and a listing of the URL's that I have shorted for my reference. It's also got a list of the last 11 URLs created on the site (the long versions so you can't be fooled into visiting dodgy shortened ones.